Buttons & Beads Cross Stitch Kits from Mill Hill add a creative touch to any home decor. These new coffee themed designs are ideal for a kitchen or dining area. Buttons & Beads kits include glass beads, ceramic button, perforated paper, floss, needles, and a chart with instructions. The final design size is 5" x 5". These embroidery designs are shown with coordinating Mill Hill matte blue frame. Delight a cappuccino or latte lover in your life with one of these rich coffee designs! See our complete selection in the Mill Hill Beaded Stitch Kits section! The Simple Quilts collection of easy quilt kits features modern fabrics and simple quilt patterns to make a decorative throw or lap quilt. This beginner quilt kit includes premium 100% cotton fabrics - enough to complete the quilt top, backing, and binding. You'll find easy-to-follow instructions to guide you through your quilting project. The simple design of the quilt makes it an easy kit for beginners or a quick quilt project for experienced quilters. Your finished quilt will measure 60" x 64". 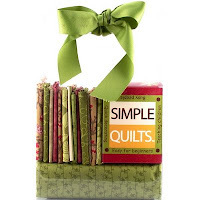 This is a convenient starter kit for learning how to quilt or for teaching children or adults to quilt. When you're finished, you'll have a beautiful quilt for keeping warm. When it's not being used, throw it over a sofa or chair to add a designer touch to your home decor. You'll find this and other Simple Quilts designs in the Quilt Kits section of the store. 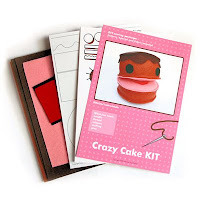 Kits make learning a new craft simple and fun! Explore a variety of craft kit categories at Weekend Kits. 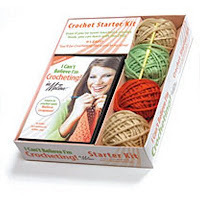 Beginner Crochet Kits & Jewelry Kits at Weekend Kits! There's still time to shop for holiday gifts at Weekend Kits! Craft kits are perfect to have on hand for a relaxing weekend at home with family & friends. Cozy up to the fire with a beginner knitting kit, watch your favorite movie while embroidering a tea towel, or invite some friends over for a jewelry making party. You'll find a variety of craft kits for all levels of crafters at Weekend Kits. Here are some new product arrivals you won't want to miss. Learn to Crochet Kit & DVD - I Can't Believe I'm Crocheting! This newly released beginner crochet kit from Leisure Arts includes a crochet hook, 60 yards of yarn, and a 100 minute instructional DVD with expert Melissa Leapman. The DVD includes an auto-pause feature that makes it easy to set your own pace. An alphabetical index, reference library, and troubleshooting guide let you to customize your learning to meet your needs. Learn to crochet with this kit that includes everything you need to get started with confidence! You'll find this kit in the Knit & Crochet Kits section of the store. 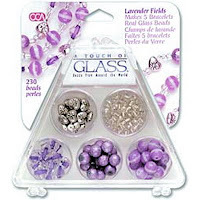 Touch of Glass Bead Kits from Cousin include enough real glass beads to make 5 bracelets. These kits make great stocking stuffers for crafters! Use the colorful glass beads in these collections to make perfectly coordinated bracelets, necklaces, and earrings. Accent beads are included too! This glass bead jewelry kit is also available in Fresh Mint and Timeless Teal color assortments. If you're new to jewelry making, visit the Jewelry Kits section to see our complete selection of beginner kits, including jewelry making tools, supplies, and step-by-step instructions for making your own fashion jewelry at home. 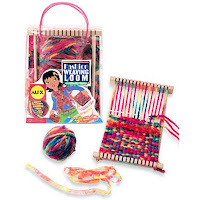 The Fashion Weaving Loom Kit from Alex won Dr. Toy's 100 Best Classic Toys award. This complete kit includes a hardwood weaving loom, chunky rainbow yarn, fluffy yarn, weaving needle, loom comb, stitching needle, and illustrated instructions. Kid's will learn to weave their own fashion accessories in no time! 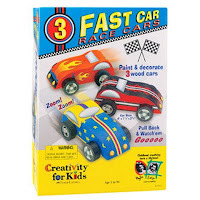 The Fast Car Race Cars Kit is a paint & play activity kit from Creativity for Kids. Kid's will paint 3 wood race cars and then customize them with stickers. When they're finished creating their cars, they can pull them back and watch them race! You'll find these kits and many more in the Kid's Craft Kits section. Explore a wide variety of craft kit categories at Weekend Kits and find a creative project kit for everyone on your list. New Plush Toy Pattern & Fabric Kits! DIY Fluffies Kits make it easy to create your own soft designer toys at home! You'll find these adorable stuffed toy sewing kits in the Easy Sew Kits section of the store. These cute soft toys are so popular right now and it's easy to see why with such a fun variety of creative designs. We have 3 new DIY soft toy sewing kits to share with you today, including a green monster, plush chicken, and crazy cake! 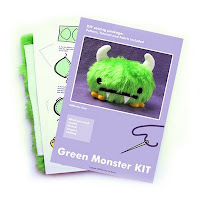 The Green Monster is an easy sewing project for you to make this furry monster toy. No one will be able to resist picking up this lovable little guy! Your completed monster will be approx. 6-1/2 inches tall. 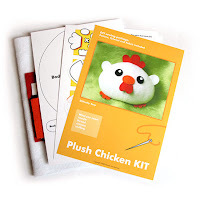 DIY Fluffies stuffed toy kits include the sewing pattern, all the fabrics for one soft toy, and detailed instructions. The Plush Chicken is an easy sew project for you to make this soft & huggable chicken toy. He's just waiting to be picked up! Your completed chicken will be approx. 5 inches tall. You'll need to have some basic sewing supplies on hand to complete your stuffed toy project, including a needle, thread, scissors, stuffing, and pins. The Crazy Cake will bring out smiles in everyone! This soft toy is an intermediate level sewing kit, ideal for experienced sewers. Your completed cake will be approx. 5 inches tall. After you complete your first plush toy project, you can use the pattern again to make additional stuffed toys for family and friends. These adorable little toys make great gifts! Visit the Easy Sew Kits section for details on these kits and to see our other stuffed toy sewing pattern and fabric kits. You can learn more about DIY Fluffies at the Fluffels website. You'll have fun making your own unique soft toys at home and these creative kits make it so easy to get started. Weekend Kits offers a wide variety of creative project kits. Our focus is to make doing crafts convenient, easy, and fun for everyone! Our selection of kits is always changing, so make sure to check back often to see the latest kits we have for you.